SEATTLE, Nov. 17, 2017 /PRNewswire/ -- Pop-In@Nordstrom is celebrating the holidays with a design-centric gift shop in collaboration with The Museum of Modern Art's MoMA Design Store, known for its curator-approved gifts that bring quality, creativity, and design innovation to everyday living. The shop opens November 17 in select Nordstrom stores and online. 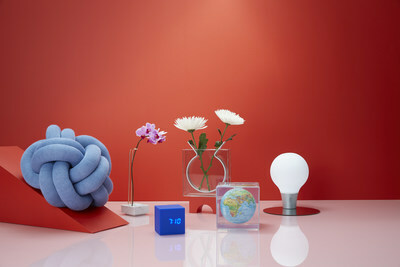 Each item selected by MoMA Design Store is product-tested using real-life scenarios, and reviewed by MoMA curators. Prices range from $10 for coasters disguised as toast to $6,000 for a giant clock made up of 24 smaller, round clocks choreographed together to form one digital display. 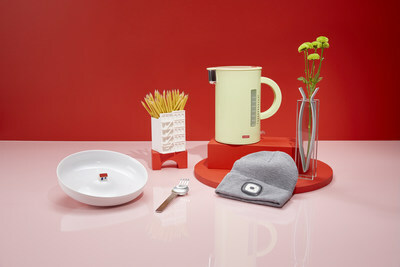 "I've always been a huge fan of MoMA Design Store and their ability to thoughtfully consider the most interesting, exclusive, and enticing products from around the world and to have the opportunity to partner with them this holiday season is very exciting," said Olivia Kim, vice president of Creative Projects at Nordstrom. "We are looking forward to seeing our customers engage with an institutional and iconic brand through a compelling and fun shopping experience and hope they love it as much as we do." "MoMA Design Store is thrilled to present a selection of MoMA curator-approved design objects and gifts to the incredible Pop-In@Nordstrom customer base this holiday season," says Thomas Randon, General Manager, Retail at The Museum of Modern Art. "With such an engaging shopping format, it is a wonderful opportunity for design-conscious shoppers on the West Coast, in the Midwest, and in Canada to discover our unique products in person." In addition to MoMA Design Store gifts, the shop includes a selection of gifts hand-picked by Kim and her buying team spanning home, kitchen and dining, tech and gadgets, accessories, beauty, toys and games, and more. There will also be a build your own box program within the shop, allowing customers to pick five out of 25-30 featured products for a total of $50. Featured items include Christmas cards, wrapping paper, twine, stamps, toys, beauty, and more. Click HERE to access imagery and product details. The shop design is a clean and simple aesthetic featuring shelving in a gradient of colors from red to magenta that changes in appearance as it is viewed from different angles. Launched in October 2013, Pop-In@Nordstrom is an ongoing series of themed pop-up shops that transitions every four to six weeks to offer a new shopping experience and batch of new, often exclusive merchandise. Pop-In takes two forms: a shop curated around a theme featuring brands across different product categories (fashion, beauty, lifestyle, home/garden, sports/outdoors, etc. ), or a partnership with a single brand to bring "the world of" to customers. Pop-In@Nordstrom was built on a monthly rotation to keep customers coming back to discover new brands, new merchandise and create a fun and compelling experience in stores and online. Each shop features a mix of hand-picked merchandise spanning the high/low price range, with price points often starting at $5. Pop-In@Nordstrom was the first initiative from the Nordstrom Creative Projects team, under the direction of Olivia Kim (vice president of Creative Projects). In her role, Kim focuses on creating energy, excitement, a sense of discovery and a bit of disruption through engaging and unique shopping experiences at Nordstrom, both in-stores and online. Kim's Creative Projects initiatives have established Nordstrom as a platform to test retail concepts, bring limited distribution collections to customers, and introduce them to the best up-and-coming brands and new talent. Pop-In@Nordstrom partnerships have included: Pop-In@Nordstrom partnerships have included: Aesop, Alexander Wang, Converse, Danish home goods brand HAY, design-driven wares from Los Angeles based Poketo, Everlane, Gentle Monster, goop, Hanes, home goods from Liberty London's Flowers of Liberty collection, Nike, Opening Ceremony, rag & bone, the best of Korean fashion and beauty, Topshop/Topman, the U.S. debut of Hong Kong fashion collective I.T., the Italian Trade Commission, VANS, and Warby Parker. MoMA Design Store offers curator-approved products that bring quality, creativity, and design innovation to everyday living. Every purchase supports groundbreaking exhibitions at The Museum of Modern Art (MoMA), a wide range of education programs, and the preservation of the Museum's collection. In 1932, MoMA was the first art museum to establish a curatorial department dedicated to Architecture & Design, and by mid-century, it was playing a leading role in defining and promoting the values of "Good Design," which MoMA Design Store continues to champion. Shop online at store.moma.org, or at our locations in SoHo, on 53rd Street, and within The Museum in New York City.